Ten unusual habits to lose weight without diet or exercise. Well, it looks like it's time to employ some alternative perhaps a little weird method to get rid of excess weight once and for all. What do I mean by weird how about smelling apples before meals or changing the color of your plates? Hey, this stuff has been tested and proven to work. So, if you're interested in getting to know some unconventional weight loss tips then just keep on reading. But first and foremost have you subscribed to our blog. Yes, we've got tons of new helpful and informative article up, every single day. So, what are you waiting for, do subscribe to our blog. #1 Make a water-drinking schedule. I know you've heard it time and time again but there really is a reason why people always tell you to drink more water. Upping your water intake is one of the cheapest yet most effective ways to shed unwanted pounds. Water helps you burn more calories and reduces your appetite. The hardest part is remembering to give your body regular doses of the H2O it desperately needs. But don't worry we've got you covered on how to make that easier. And you absolutely need to hydrate at dinner time or after to help the food move easily and make your stomach feel later. #2 Smell green apples or bananas before your meals. This technique is scientifically proven by Dr. Alan Hirsch, a neurologist and director of the smell and taste treatment and Research Foundation in Chicago. His research began with 3193 overweight volunteers who he instructed to sniff bananas, green apples, and peppermint whenever they felt hungry. After six months some of them lost as much as a hundred pounds. So, how do you like them apples! #3 Light a vanilla candle before dinner. This might sound absurd considering how much vanilla goes into different cakes muffins and puddings. But one study found that the vanilla scent works wonders when you're trying to lose weight. It activates different chemical reactions in the brain making you feel less hungry. It can specifically help you tone down your sweet cravings, according to ICU dietitian, Catherine Collins, who led the study. If you want to give it a try to buy some vanilla patches or light a vanilla candle before or during dinner. As an added bonus it'll give you a nice serene atmosphere while you enjoy your meal. #4 Take pictures of your dishes. Well, when you're trying to get the best shot to share on your social networking page you can't help but notice the details of your food and this is perfect since it might make you stop for a second and rethink what you're about to eat. If you've got a bunch of pictures on your page of pizza slices and hamburgers dripping and globs of grease or anything else over the top? You just might be swayed to change your ways and start picking healthier options. #5 By some blue plates. If you surround yourself with the color blue like putting up blue wallpaper or eating from blue plates you'll lose weight much faster. A study found that the color blue is an appetite suppressant, which means it'll help you feel less hungry. As for what colors you should avoid definitely red, yellow, and orange. Which you might have noticed are the go-to color for fast-food chains. Well, that's because they stimulate your appetite and make you eat more. Try using smaller plates too. You know how we've all been programmed from childhood to clean our plates? 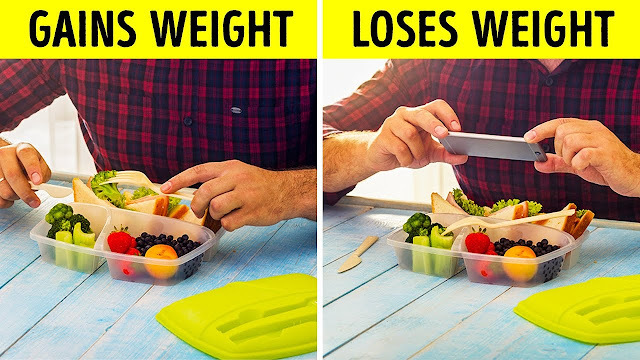 Well, you can totally do that and eat less if you use a smaller plate. It's like tricking your own brain. #6 Eat eggs for breakfast and spicy foods for lunch. only our eggs low in calories they're also really filling and hold you off for a longer time. That means you won't feel tempted to snack in between meals. Plus they're full of vitamins A, D, E and B-12 as well as protein, zinc, and iron. That's why experts consider the egg a superfood. And if you can find that little trick, with eating something with chili or red pepper for lunch. Not all the time though, it'll speed up your metabolism. Helping you achieve your dream body faster. Spicy foods or the ingredients used to make them contain capsaicin. Which helps suppress hunger and increase a shooting. But if you don't like spicy foods then settling on eggs will do just fine. #7 Think of some challenges that will motivate you more. Let's be honest, exercising and being careful of what you eat is a lot of work and it can be downright tedious. Well, all you got to do is tweak your workout routine or diet plan by adding some quirky challenges to make them more fun. Try doing 10 push-ups for every potato in your dinner or run up and down the stairs 5 times for every time you enjoy a candy bar. If you make it fun you won't even notice that you're burning calories. #8 Sleep in a cold room. Just take it from the United States National Institutes of Health, according to their research sleeping in a cold room can activate and increase the body's brown fat, which in turn speeds up metabolism. Level up this cool challenge by covering yourself with a thinner blanket or sleeping naked. Meringue on the smaller pant size. #9 Choose slowly and thoroughly. Kyushu University's Graduate School of Medical Sciences. It's all due to the fact that chewing slowly and thoroughly gives your stomach enough time to tell the brain that it's full. That, in turn, makes you eat last. Ideally, it should take you around 20 minutes to finish a meal. Savor and enjoy your food and get, the most out of each bite. #10 Drink a glass of wine daily. That's right folks this is based on a joint study conducted by Brigham and Women's Hospital and the Harvard School of Public Health. They found out that a glass of wine a day can help you lose weight faster. Just don't overdo it. Since the same study found that people who drank more than two glasses of wine daily struggled more when dieting versus those who didn't drink at all or had just one or two glasses. So, if you're of age cheers to a slimmer waistline. Do you know of any other weight loss tricks that people can incorporate into their daily habits, please let us know in the comments below. If you learn something useful from this article be sure to share it with your friends.